Hydra is the latest chess supercomputer to lay down the gauntlet to the world's top players. Its architects say it is the greatest ever built, but don't expect it to rejoice in victory or get the post-match drinks in. It is a behemoth of a machine that pits 32 linked processors against its flesh-and-blood opponents. Hydra's backers claim it can analyse 200 million chess moves in a second and project the game up to 40 moves ahead. Computer programmers have been pitting their wits in the Game of Kings for decades, but only recently have they truly taken the upper hand. 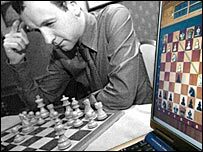 The chess world was stunned when, in 1996, the then world Number One, Garry Kasparov, lost a game to IBM's Deep Blue. 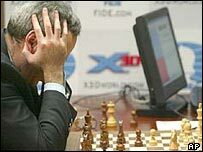 Kasparov went on to win the overall match but bigger losses lay ahead, in the rematch a year later. Then, the grandmaster was conclusively beaten. It was a decisive episode in the battle of Man v Machine. 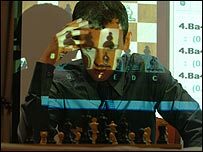 Since then Kasparov has drawn with two top programs, X3D Fritz and Israeli program Deep Junior. Now comes Hydra. It will take on England's Michael Adams, the British No 1 and world No 7, in a six-match contest at Wembley from 21 June for a £80,000 purse. He should not be deceived by Hydra's humble laptop guise. 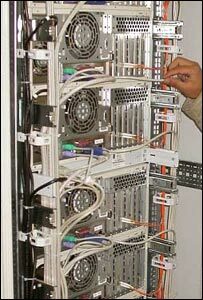 The computer's engine room lies 5,651 miles away in a bunker in Abu Dhabi - it merely sends its moves over the net. And its backers, the PAL computer services group, believe it will beat Adams soundly. The machine has played eight games against grandmasters so far, winning six and drawing two. So it is perhaps not surprising that it quickly humiliates me, despite the advantage I have of starting with white. Even for a strong human player, which sadly I am not, taking on a computer is a depressing affair. It's like coming up against a steamroller, remorselessly moving forward, impossible to catch out. And even the most arrogant human opponent does not give you a running tally of how thoroughly it is beating you, while it is doing it. The machine takes no pleasure in trouncing you and can't even go for a pint afterwards. I had even warmed up a little earlier, playing Fritz, a commercially-available chess program, at home. It takes Fritz a mere 35 moves to beat me. Pretty quick. It only takes Hydra 19 moves to force my resignation, after a series of increasingly comical blunders on my part. Blunders are the best illustration of why machines have an edge over humans. A human can have a bad night's sleep, hear some bad news, or have too much to drink the night before, and suffer. Distraction in this case leads to my queen being pinned to my rook. The only consolation is that Hydra had already worked out it had won some moves before. On only two occasions does Hydra think about its move, taking a satisfying pause of a few seconds. But these are no moral victories. That it has to think after two of my moves suggests I have done something silly. Only a rat gnawing through the internet cable could have saved me from this beast. The mythological Hydra had nine heads and kept sprouting more. The chess Hydra only requires part of one head to give me a stuffing. So does Adams fancy his chances? By the state of his pre-match comments, the chess champ may also be powered by a chip. "It will be a very tough match. I will do my best... I'm going to be going in without a lot of experience. It would be very nice if I can secure something in the first game." But the sight of this novice taking on the machine makes even him laugh. "If you beat it, send me the game," he shouts over his shoulder as he leaves the launch. Chess master and writer Malcolm Pein thinks Adams's style of play may give him an advantage over his defeated contemporaries. "There is no doubt Kasparov tries to break down the wall, where what you should be doing is chipping away at the foundations. The computer sometimes plays quite off-the-radar for a human player. You have to have the kind of personality where you don't get disturbed."